PP Fibres For Waterproofing Coating are our combination of Multifilament Straight Fibres Fibrillated Mesh Fibres "NOKRACK" is chemically surface treated 100% Virgin high tenacity polypropylene fibre based concrete additive and is available in graded lengths for use in water retaining slabs / structures. It is available in multiples of 10 mm & 20 mm to give 3D micro-reinforcement. This is to be used as micro reinforcement at minimum of 0.9 kg/m3 of concrete. NOKRACK complies with ASTM C 1116 and ACI committee report 544-1R. PP Fibres For Waterproofing Coating are our combination of Multifilament Straight Fibres + Fibrillated Mesh Fibres "NOKRACK" is chemically surface treated 100% Virgin high tenacity polypropylene fibre based concrete additive and is available in graded lengths for use in water retaining slabs / structures. It is available in multiples of 10 mm & 20 mm to give 3D micro-reinforcement. This is to be used as micro reinforcement at minimum of 0.9 kg/m3 of concrete. NOKRACK complies with ASTM C 1116 and ACI committee report 544-1R. Increases water proofing ability of concrete (reduces permeability). Reduces need to do water proof plaster, pressure grouting. Reduces shrinkage and plastic cracking in concrete. Makes the concrete dense & strong. Roof slabs, wet slabs, toilet floor slabs, bathrooms, utility areas & kitchens. Effluent or sewage treatment tanks. Length : Multiples of 10/20 mm. Construction : Combination of straight + fibrillated mesh fibre. Melting Point : 165 Deg C.
Alkali Resistance : Completely resistant. Dosage: Minimum 0.9 kg /m3 of concrete or @ 125 g /50 kg bag of cement. 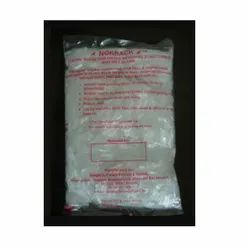 Water Cement Ratio : NOKRACK is a physical micro-reinforcement and does not react chemically hence additional water is not required. Note: Fibres should not be used for replacement of structural or load bearing reinforcement. Looking for PP Fibres For Waterproofing Coating ?